3rdbell is a Professional, high quality and Responsive Video Blogger Template which is specially designed for video sites , video bloggers and video makers. You should easily show your videos with grid style. 3rdbell is a most powerful and fast loading video blogger template for video sites. 3rdbell supports Streaming from youtube and vimeo video embed code. 3rdbell has many awesome features like video slider, Responsive design , Menubar, Post views counter and much more. If you wanna make a professional video website using blogspot, then 3rdbell blogger themes is perfect for your blog. Because its a high quality and responsive professional video blogger template for blogspot site. 3rdbell is best video blogger template of 2016. Sometimes some users looking for a video blogger themes like youtube. MS Design BD always share awesome templates for blogger. 3rdbell blogger themes is a unique and professional entertainment blogger template. Using this template you can make a professional entertainment website using blogspot. If you want to Free responsive Blogspot video template, then 3rdbell is perfect for you. Free download 3rdbell video blogger template and make a professional video blog with blogspot. 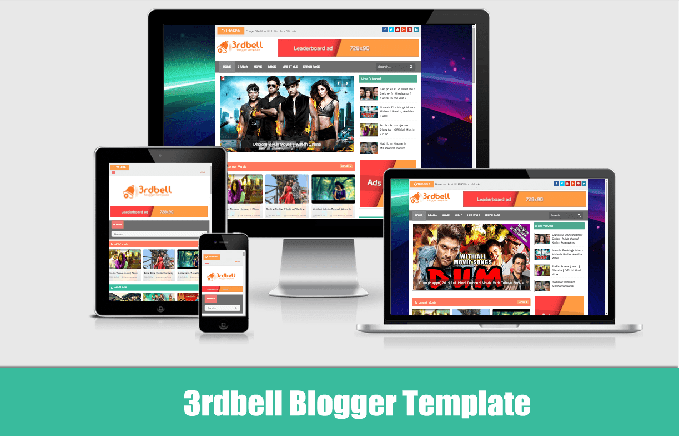 3rdbell is most powerful video template for blogger. In free version, some features are disabled. If you want to get all full features, then you have to need buy full version. Following are some of the key features of 3rdbell Professional Video Blogger Template. 3rdbell is perfect for any type of Cinema, Movie Promotion, Theaters, Blogs and Movie Communities. This template give a professional look of your blog. 3rdbell has some awesome features like recent post slider, big frame player and most interesting thing is post views counter. first time we used post views counter in this template. How To Add Featured Videos In Sidebar?? Is There Any Free Widget To Add Recent Posts In Sidebar With Thumbnails??? This template is wonderful! But, I wish I had a good knowledge of customizing.. I uploaded only xml. file, but do I need to upload js. and css files on the third hosting site to get the same result as the demo? Negative. You have to need buy pro version for get same results as demo. What is the extra facility in paid temple? Awesome template! I use 3rdbell template for my blog. But, I want to submit a request, can you help me to add social media instagram in top right corner? We recommended you, check out our http://www.msdesignbd.com/2015/11/3-style-social-media-icons-widget-for-blogger.html this post. I have Purchased Your Pro Version. How to Configure Category Boxes?. am Adding HTML/JS --> Content area [videos][pvid] not displayed. Make sure you have an uploaded image on every post. But slidershow don't work . please help me .